Porec is one of the most popular resorts in Croatia and dates back to pre-historic times. It provides a taste of Roman history in Croatia, with a number of historical sites to visit in the old town. The main street in Porec is called Decumanus which even pre-dates Roman times. 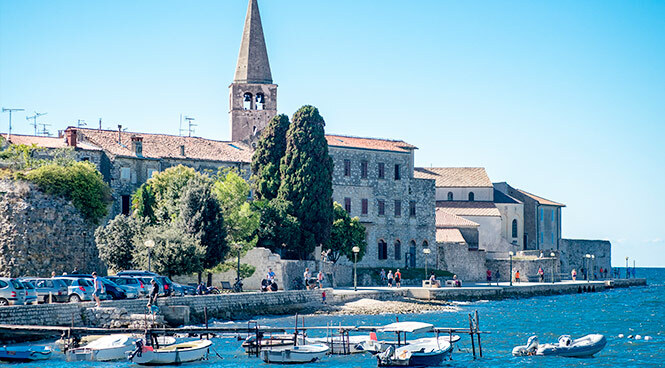 Getting to Porec is quite straight forward, with most visitors using the main airport of the region, Pula, and pre-booking car hire for the onward journey.Porec is one of the most popular resorts in Croatia and dates back to pre-historic times. It provides a taste of Roman history in Croatia, with a number of historical sites to visit in the old town. The main street in Porec is called Decumanus which even pre-dates Roman times. Getting to Porec is quite straight forward, with most visitors using the main airport of the region, Pula, and pre-booking car hire for the onward journey. 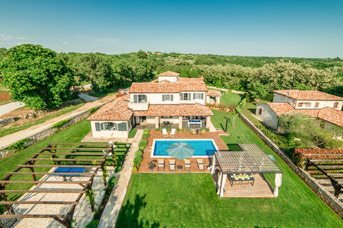 Porec is nestled on the western shore of Istria and we have a number of small and medium sized family-friendly villas within easy reach of the coastline here. Discover dazzling Blue Flag beaches, trendy waterfront restaurants, cycling trails and water sports. Iconic cultural sites in Porec include the UNESCO protected Euphrasian Basilica and the many historic buildings of Porec’s Old Town. Porec is a town with vast history with remnants of its past in the heart of its old town. From Ancient Roman times, the streets of Porec continue to preserve their original architecture and numerous cultural and historical monuments. In addition to culture and tourism, Porec also has an abundance of sports and entertainment. The hot summer nights in Porec are enriched by numerous restaurants, bars, clubs, bars and casinos. 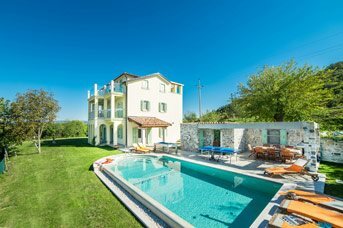 Surrounding the resort of Porec, there are many smaller towns around which our villas are dotted around. These include Tar-Torre and Vabriga-Abrega. Elevated, at over 100 metres above sea level, one side slopes towards the sea and on the other towards the mouth of the Mirna River. There’s spectacular views towards Novigrad-Cittanova in the north and Porec in the south. On a clear, sunny day you can see the Alps and from the top of Tar-Torre's bell tower and even Venice! This region is also famed for its exceptional olive oil. Another must-see is the well-known village of Motovun, where you can sample a real taste of Istrian life. Perched high on a hilltop, you can expect striking venetian architecture, stunning views over the Mirna River valley as well as a selection of restaurants dotted around the cobbled streets and charming main square.